Hilton has announced their Fall 2016 Hilton HHonors promotion, called Double Up. As the name states, you can double up on points for hotel stays made between September 1st and December 31, 2016. You must sign up ahead of time in order to participate in the promotion, so be sure to do that now. Offer valid September 1, 2016, through December 31, 2016 (“Promotion Period”) at any hotel or resort within the Hilton Portfolio. Hilton HHonors members must first register at HHonors.com/DoubleUp prior to completing a stay within the Promotion Period. Registered Hilton HHonors members will only receive Bonus Points for nights completed during the Promotion Period, regardless of a check-in date before the Promotion Period begins or a check-out date after the Promotion Period ends. Registered Hilton HHonors members will earn Double HHonors Bonus Points per stay during the Promotion Period. “Double Points” means you will receive a bonus equal to the number of Base Points earned during a stay. There is no limit to the total amount of Bonus Points that may be earned during the Promotion Period with this offer. However, there are restrictions on the amount of Base Points that can be earned on a single stay at certain brands. See HHonors Terms & Conditions for more details. Bonus Points earned on Base Points do not count toward tier qualification. Please allow six to eight weeks from completion of your stay for points to appear in your Hilton HHonors account. This is a straightforward promotion. It’s nice that Hilton has been including all of their properties in their promotions as of late. 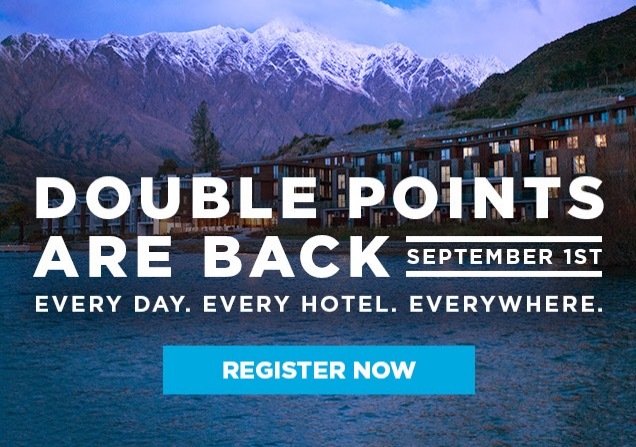 Although you’re not going to get points-rich off of it, double points are double points, and will get you that much closer to your next free hotel night if you are planning on staying at any Hilton properties this fall.